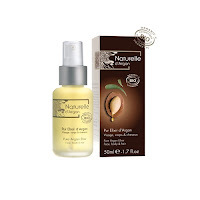 Naturelle d'Argan is the leading Argan oil skin care brand in France. Their the world’s only 100% pure deodorized argan oil and incorporates the highest possible concentration of this oil in their products. Argan oil is a rare and precious oil that only grows in Morrocco. Naturally rich in anti-oxidants, argan oil helps to combat the signs of premature aging and sagging skin and can even clear up acne! It's rich in essential fatty acids: Omega 6 and 9 and Vitamin E and Polyphenol which nourishes, protect and moisturizes your skin. Naturelle d'Argan offers a full range of argan oil skincare products on their website. Their products are organically certified by ECOCERT and eco-friendly because their products are made with recyclable packaging. Here is my review of the Pure Argan Oil Elixir and Regenerating Night Care Balm. For face, body and hair. Naturally rich in anti-oxidants, Pure Argan Oil Elixir helps to combat the signs of premature aging and sagging skin. Argan oil is rich in essential fatty acids: Omega 6 and 9 and Vitamin E and Polyphenol which nourishes, protect and moisturize your skin. These natural anti-aging ingreients also helps combat signs of premature aging and sagging of the skin. I used Argan Oil Elixir as my daily moisturizer. It feels incredible when you apply it to your face. It's very hydrating and what I love about argan oil is you can actually see plumper, firmer skin right after the first application. It didn't cause any break outs or irritation to my oily/combo skin and the results were a dewy, fresh glow to my skin and beautiful shine and elasticity to my hair. Argan oil works for all skin types and balances oily/combo skin, so you'll actually produce less oil and if you suffer from acne, your skin will clear up and scares will fade. If your new to argan oil or just need to stalk up on more, I highly recommend you try it. You can get yours here. This argan oil infused night care blam is extremely rich and luxurious in texture and made with a unique combination of natural ingredients to pamper your skin. You get the amazing benefits of Argan oil, combined with the nourishing and protective properties of natural Beeswax, and the softening properties of Shea butter. This highly moisturizing balm can be applied to your face and neck. I used Regenerating Night Care Balm as my nightly moisturizer. It's very rich and emollient. It's great for all skin types, especially dry skin. I really noticed a difference once I applied this super creamy balm to my skin and left on over night. I noticed more even skin and my pores were almost pore less. I love that it's packed in a convenient balm, so there is no mess or spills to worry about and it's perfect for travel. It's ideal for mature, aging skin and very dry skin types. I highly recommend you try this if you need a great hydrating cream for night time. You can get yours here. wow this product sounds useful and good for skin care. I always love to try some special natural products which ingredient with some essential oils like argan oil.